Work in style and enjoy the comfort! The Men's Cherokee Luxe is designed with easy care fabric that is sure to keep you cool and comfortable all day. 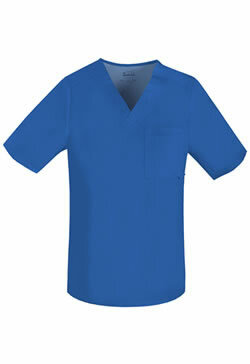 This v-neck top features a double chest pocket with an I.D. loop, back yoke, double needle topstitching and side vents for the ease of movement. Center back length: 28 1/2" 51%Polyester/46%Rayon/3% Spandex Twill. Sizes: S-XL and Plus Size: 2XL-5XL. Available in colors: Black, Ceil Blue, Caribbean Blue, Teal, Navy, Pewter, Royal, White, and Wine. Make a complete set and add the Cherokee Luxe Men's Pant #1022.